Location…Location…Location!!! Do you know where The Mesas is located? 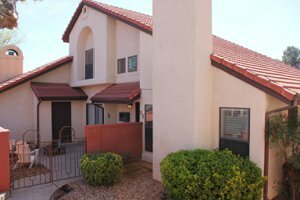 The Mesas in St George is located just off River Road, steps away from everything you need! You’ll find several dining venues, Target, Harmons Grocery Store, Intermountain Hospital…. all either across the street or less than one block. 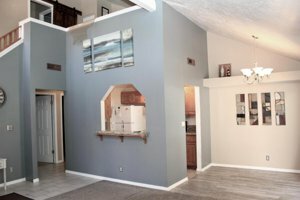 Not far from Dixie University and easy access to I15, this is quite possibly the best location for a primary residence or a second home. Surrounded by lush green common area lawns and large mature trees, and steps away from the clubhouse, pool and spa---even though there is a one car garage, you won’t even need a car, living here! This condo is an end unit, offering two enclosed patios (one facing north and the other towards the west) and surrounded by large shade trees and rolling green grassy common areas. The interior has been recently updated with new carpet, tile, paint, granite, and a new walk in shower. As you enter, you’ll appreciate the vaulted ceilings. The fireplace has been remodeled with beautiful tile that runs the length of the wall. There is a dining area which opens up to the side patio. The kitchen is a galley style with ample counterspace. There is a laundry area just off the kitchen. On the main level you’ll find one of the two ensuite bedrooms (both rooms have an attached bathroom). This lower master is generous in size and opens up to the front enclosed courtyard which is the larger of the two patio spaces. New granite and tile is an updated touch added by the current owner. Neutral tones will match any décor. 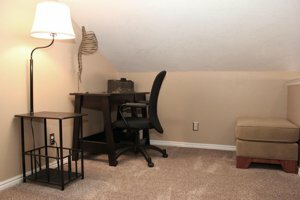 Upstairs at the top of the landing, you’ll find a versatile loft space, which can be utilized as an office, den, or play area. Just off the loft, you’ll find the upstairs master bedroom with an attached bath. This room is spacious, and the bathroom has been totally remodeled. There is a tiled walk-in shower and granite counters on the vanity. There are several closets and storage options throughout the home. 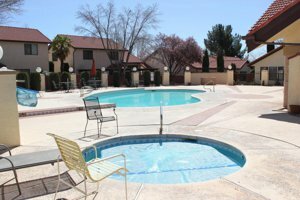 The HOA takes care of just about everything, providing you with: lawn care, pool/clubhouse, exterior building insurance and maintenance, water, sewer, trash, and even cable. The pool is a few seconds away from this home and the clubhouse is available for use for your special occasions. If you’re looking for a first-time home, a second home, downsizing, or simply your next home—be sure to give this a look. It’s difficult to find homes under $200,000 in St George—and with so much to offer, this wont last. Contact Paula Smith of RealtyPath today to schedule a showing.